Multiple fellowship positions are available at University of Arkansas under the Graduate Assistance in Areas of National Need (GAANN) program funded by the U.S. Department of Education (DoEd) for Ph.D. students interested in Cybersecurity. For application details download the PDF flyer. Students looking for special topics courses for Fall 2019 should consider the following offerings. Note, as with all 4000 and 5000 level courses, be sure to check specific prerequisites, consult with your advisor as to suitability, and perhaps discuss with the course professor as well. CSCE 4013 - Sec. 001 / CSCE 5013 - Sec. 001 Malware Analysis; Prof. Brajendra Panda. This course will offer fundamental concepts on malicious software, otherwise known as malware, that play a major role in intrusion into computer systems. It will explore various malware analysis tools and techniques. Students will be able to reverse engineer software codes to understand how they work. A major focus of this class will be hands-on laboratory activities that include dissecting software binary and understanding how to detect and eliminate malicious code. CSCE 4013 - Sec. 002 Big Data Analytics and Management; Prof. Lu Zhang. The course will discuss data mining/machine learning algorithms and database techniques and systems for analyzing and managing very large amounts of data. Topics include: introduction to big data computing and management, MapReduce, Hadoop, Spark, large-scale data mining and machine learning algorithms, streaming data analysis, NoSQL and NewSQL systems. The goal of the class is for students to understand the state-of-the-art technologies used in manipulating, storing, and analyzing very large amount of data. What is Computer Science and Computer Engineering? Innovations in the world of computer technology have changed our lives drastically over the past few decades. It’s hard to believe that twenty years ago few people had heard of the internet. Today, computer scientists are busy developing new ideas that will shape the future. Computer scientists specialize in the software side of computing, focusing on writing new programs that allow computer applications to run faster and more efficiently. You might work for a security company, creating technology that reduces the risks of viruses and hackers, or develop flight simulation exercises that allow airline pilots to practice managing flight problems. Computer engineers deal with both software and hardware. As a computer engineer, you could design entire computer systems and networks, making sure that the hardware, or physical equipment, is capable of running the appropriate software. You might build devices such as retinal scanners that identify people by checking their eyes, or you could design computers that are incorporated into prosthetic devices to aide people with disabilities. Those who continue onward to obtain a graduate degree in either computer science or computer engineering learn to advance the frontiers of science. With an MS or PhD, you will invent the new technologies that enable the next generation of software and computing devices. Thanks to a CSCE Capstone team, a real-world project is now live and operational at Fayetteville Public Television. Team members Garrett Graham, Ryan Hutslar, Jacob Krusz, Teja Nakka, Blake Reed and Jan Timpeare, under the guidance of Capstone professor, Matt Patitz, worked with FPTV to create a full featured system to carry the station into the future. For the full story, along with the FPTV's Youtube video documentation, check out the Newswire article, here. A junior at the University of Arkansas, Canon Reeves has already accomplished more in his first 20 years of life than most people do in a lifetime. Reeves is a roboticist, a student and an entrepreneur and he’s the new face of STEM in Arkansas. Reeves first started building robots at Riverview High School in Searcy and was a member of the robotics team there. During his junior year of high school, he transferred to the Arkansas School for Mathematics, Sciences and the Arts (ASMSA) due to his interest in robotics. Located in Hot Springs, ASMSA is a two-year, public residential high school and is a part of the University of Arkansas administrative system. ASMSA is also a member of the National Consortium of Secondary STEM Schools and is accredited as one of the top high schools in the country. 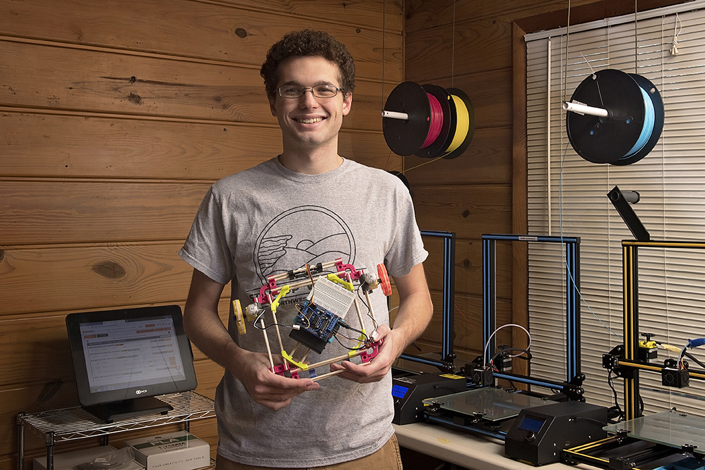 Reeves’ time in Hot Springs proved to have a profound impact on his life and career and is where he first started learning how to create his own robots in depth. Although Reeves notes the importance of his education and these relationships that have helped mold him into what he is today, it is hard for him not to fall back to an admirable humility to explain it all. “To be honest, I just got lucky,” he says. At the University of Arkansas, Reeves is pursuing a major in computer science, is the co-captain of the university’s NASA Robotic Mining Competition team and is the Creative Director at the McMillon Innovation Studio. His involvement with McMillon has proven to be a “game changer.” He has also founded three companies during his first three years at college – MORE Technologies, ArkanCode and Lovelace Technologies. CSCE Faculty Team Awarded $597,000 Grant for "Securing Cognitive Edge Computing for Healthcare"
Led by Jia Di, a team of CSCE and INEG researchers have been awarded an almost $600,000 grant in healthcare cybersecurity. The grant, managed through the Arkansas Security Research and Education (ASCENT) Institute, will support five PhD. students. In addition to Di, the project directors are Dale Thompson, Qinghua Li, and Alex Nelson in CSCE and Chase Rainwater in INEG. Read more here. Dr. Yarui Peng Wins CRII Grant! Dr. Yarui Peng, Assistant Professor in Computer Science and Computer Engineering (CSCE), was recently awarded a CRII grant by the National Science Foundation (NSF) to conduct research on Design, Extraction, and Optimization of Multi-Chip Fan-Out Wafer-Level-Packaging for Low-Power Heterogeneous Systems. The $175,000 grant is to develop a Computer-Aided Design framework to improve the performance and energy efficiency of next generation computers and mobile phones while reducing the design time and efforts for chip engineers. This project will develop the key models and Computer-Aided Design (CAD) tools to enable integrating various heterogeneous components into advanced 2.5D and 3D integrated circuits. It aims to address the major challenge of maintaining signal integrity and electro-thermal reliability in a powerful yet compact system with multiple ICs closely packed together to improve energy and cost efficiency. Additionally, a graduate course on CAD and physical design will be offered, where undergraduate and graduate students will have the opportunity to learn CAD algorithms, circuit design techniques, VLSI design flows, and to practice their programming skills by developing their own CAD tools through course projects. Read more. Dr. Dale R. Thompson teams up with Dr. Steven Ricke from the Division of Agriculture under the ASCENT Institute to train food science graduates to protect U.S. food systems from cyberattacks. Read more here. Qinhua Li Wins NSF Career Award! Dr. Qinghua Li, Assistant professor in CSCE has received one of the National Science Foundation's most prestigious grants for early career faculty members. The NSF's Faculty Early Career Development Program Award, known colloquially as a CAREER Award, is considered the most prestigious awards from NSF. Read more of the story here. High school students from across Arkansas gathered in March at the University of Arkansas for the annual High School Programming Competition, hosted by the Computer Science and Computer Engineering Department. More than 60 teams of students squared off in a test of programming and problem-solving in the event, which is sponsored by Walmart, ACM and Acxiom. Read the Newswire story. The Cyber Hogs, a team of 8 undergraduate and graduate students in computer science and computer engineering, recently competed in the National Collegiate Cyber Defense Competition in Tulsa. For more check out the Newswire article. This past weekend the local cybersecurity club, the Cyberhogs, qualified for the upcoming Southwest Regional Collegiate Cyber Defense Competition (CCDC), to be held March 23-25, in Tulsa, Oklahoma. Of the 18 teams competing the Cyberhogs were in the top 8, now heading to the Regionals. At the February 17 qualifier, teams was given an existing network configured with various services with vulnerabilities, and teams were responsible for securing these and ensuring their continued operation. Meanwhile a "red" team attacked these services. Through the competition services were randomly checked with points granted if they were still up and running. In addition, there were business injects throughout the competition. Teams were responsible for answering requests, memos and correspondence with varying deadlines. The students that competed were Andrew Beers (team captain), Alicia Gillum, Taylor Kinsey, Chenglong “Jim” Lin, Yasir Mohammed, Lauren Rainbolt, Clayton Townsend II, Dylan Walker with alternates Edward Leonard, Andrew Nguyen, Zack Roth, and Trevor Weihrauch. The coaches were Dale R. Thompson, Associate Professor, Dept. of Computer Science and Computer Engineering (CSCE), and Alan Greenberg, CISO with ITS. Four CSCE students, Sarah Colpitts, Victoria Hobbs, Kylie McClanahan and Lauren Rainbolt, recently attended the Grace Hopper Celebration, thanks to the generosity of Walmart. The three-day conference is the world's largest gathering of women technologists. On November 4th, two CSCE student teams competed in the ACM Collegiate Programming Contest, Mid-Central Competition, traveling to the Fort Smith site for the all day contest. Razorback1 (Daniel Hader , Jace McPherson and Joseph Zhang) took first place at the regional site, solving 6 of the 9 problems within the 5 hour time limit. The Razorback2 team (Trevor Barlett, Tara Moses and Garrett Vanbuskirk) came fourth at the site, solving 3 of the 9 problems, missing a tie for 2nd place by a matter of minutes. Congratulations to the teams and their faculty mentors and coaches. In 2017 the Department gained two new faculty members, Yarui Peng and Alexander Nelson, both at the rank of Assistant Professor. Dr. Peng joined us in January after earning his doctorate in electrical and computer engineering from the Georgia Institute of Technology. His research focuses on developing methodologies and algorithms for parasitic extraction, analysis and optimization for signal integrity, and alleviating reliability issues in thermal and power delivery in 2.5D and 3D integrated circuits. In August Dr. Alex Nelson joined the faculty, coming to us from the University of Maryland, Baltimore County, where he earned a doctorate in Computer Engineering. His research interests include emergency communications, assistive devices, and home automation. Nelson is also interested in the interworking and connectivity of all devices, especially with concern to the cloud and smart objects. Joseph Fantinel, a May 2017 CE graduate from Computer Science and Computer Engineering, who had started the PhD program, died Monday, 7/31. The students, faculty and staff of the department grieve with his family and friends. More about Joe can be found in his obituary. The Department's latest newsletter for Fall 2017 is now available. CSCE Seniors Joseph Fantinel, Andrew Felder, Joseph Gauthier, Nicholas Mize, and Dillon VanBuskirk took first place in the 2017 Senior Capstone Design Poster Competition with their Capstone project, "Autonomous Decentralized Indoor Robot Navigation Using Smart Cameras with ROS for Efficient Adaptability to Arbitrary Environments." Dr. Christophe Bobda, Professor in Computer Science and Computer Engineering, was awarded a $477,870 grant to conduct research in Reconfigurable In-Sensor Architectures for High Speed and Low Power In-Situ Image Analysis. Chenggang Lai, a graduate student in the Department of Computer Science and Computer Engineering has won second place at the ACM SIGSPATIAL Student Research Competition. Dr. Matt Patitz, Assistant Professor in Computer Science and Computer Engineering, received a $500,000 Faculty Early Career Development Program grant - known as a CAREER grant - from the National Science Foundation. The award enables Patitz to continue developing the design and analysis of DNA-based self-assembling systems.